The game runs on the Unity engine and system requirements are fairly modest. It should pose no challenge to run this at an acceptable framerate. Testing was performed on a system with an Intel Core 2 Quad Q9400 CPU with 4 GBs of RAM and an Nvidia Geforce GTX 650 Ti running at a resolution of 2048x1152. Compared to the previous titles in the series the options menu is extremely limited and even lacks basic options such a very needed field of view setting. The range of choises vary from a vsync and a windowed mode toggle to some basic levels of anti-aliasing. It is however notable, that the game can detect widescreen resolutions beyond and below the 1080p range. The default brightness setting feels strange, seeing as the balance does seems slightly off. On higher resolutions the interface appears to improperly upscale looking rather pixelated and even slightly blurry, which is mainly more noticeable when dialogues and such may appear. The range of anti-aliasing options is rather limited, and we were only able choose from very few levels of MSAA. Even at the maximum value some edges might still not be fully aliased, but this matters less at high resolutions. The game runs very well with no performance issues and it looks surprisingly good for a mobile game ported to desktop. The game can easily go over 400 FPS if not even possibly more. The loading times between the level transitions are also low, and loading a savegame is fast. The biggest problems with this port come from the controls. Having very awkward key combinations for various actions which get on the way during gameplay. By default the mouse sensitivity is far too low, and along with the very low field of view, aiming feeling far from precise. Using a higher sensitivity does not really help and in fact can make the controls feel worse.. The controls were clearly designed and optimized for tablet users, considering that the controls do feel inconsistent compared to most games on the PC platform, the takedown icons for example don't display which keys they are assigned to, leaving the user having to guess which buttons to use. It does not help the fact that no keys are re-bindable, being limited to the default layout. The menus feel really unresponsive, with the interface sometimes not registering actions at all. Navigating some in-game menus requires the user to hold certain keys down while using the mouse at the same time in order to select an item instead of relying on a basic inventory system. Although weapons can be cycled through the number keys, other items have to be selected and activated within other sub menus which is annoying. Standard options in the audio menu, though there is an issue with the sound effects sometimes completely becoming inadubile for a few seconds. 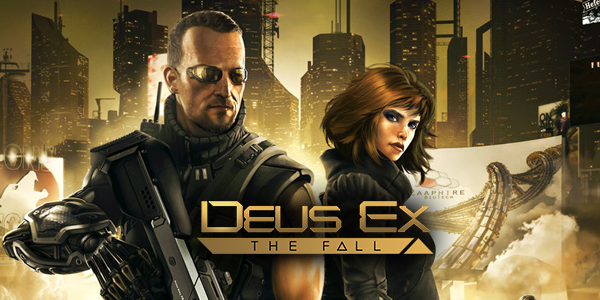 Deus Ex: The Fall is essentially a direct mobile to PC port, which explain why it feels really incomplete and the effort put into it is rather questionable. The game does certainly look decent and there are no performance issues. However the gameplay is hurt by the very poor controls. Playing with a controller in this case is sadly almost a must in order to enjoy the game properly. The Fall is free on iOS for a limited time.